Mark Millar and Rafael Albuquerque‘s Huck, from their comic series of the same name, is getting his very own bust. It is up for preorder now at a cheaper price of $84 and will go back up to the regular price of $98 for orders placed after February 14th. The bust will ship in the fall. The first 100 people who order will get a free hand-written note that says “Please Love Him” signed by Millar and Albuquerque. That, of course, is the note left in the basket with Huck when he is found in the book. 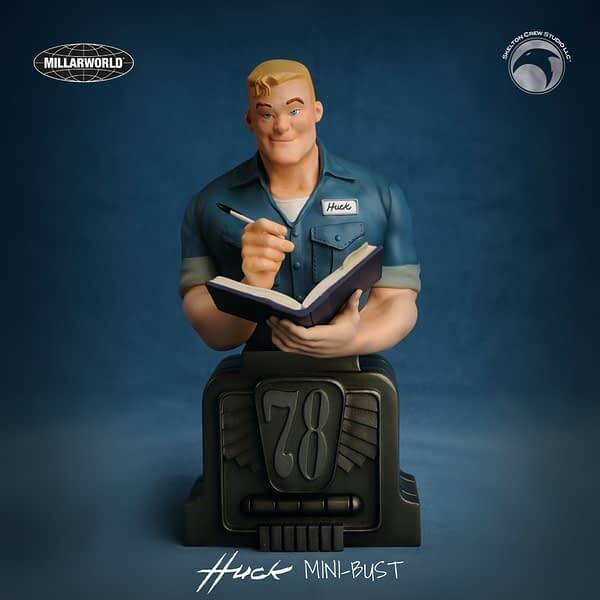 Millarworld and Skelton Crew Studio, a comic book replica studio based in the wilds of Maine, have teamed up to release a limited edition Huck mini-bust straight out of Mark Millar and Rafael Albuquerque’s stunning “Huck” series, published by Image Comics. The ultimate Good Samaritan in an unassuming small Maine town, Huck’s featured holding his book of good deeds and perched on a gas pump base from the 78 Station where he works when he’s not saving the day in ways big and small. Huck stands 8 inches tall. He’s designed by Rafael Albuquerque and studio head Israel Skelton and sculpted with amazing detail by Tony Cipriano. “Huck” was one of the many properties acquired by Netflix in its groundbreaking purchase of Millarworld last August. When that news broke, Nerdist was quick to name “Huck” one of Millar’s seven titles they’d love to see on Netflix someday. The Limited Edition Huck mini-bust is available for pre-order thru Feb. 14 at www.skeltoncrewstudio.com. As a sweet bonus, the first 100 orders will receive a “Please Love Him” handwritten note from Rafael Albuquerque — the same note Huck’s discovered with as a baby — that’s signed by both Albuquerque and Mark Millar. “The book is gorgeous and moving, and we’ve been excited to work with Mark and Rafa — it’s hard to find nicer, more talented people,” said Israel Skelton. When Millar and Skelton Crew Studio first announced they’d be teaming up to produce the bust, Millar called “Huck” one of the favorite works in his long career. You can preorder Huck right here.